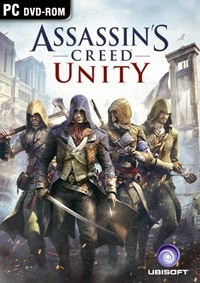 Assassin's Creed: Unity is another part of the most popular action adventure produced by Ubisoft, known as a father of the Prince of Persia series, Far Cry, Rayman and so on. This is one of the biggest projects in the history of the video game industry. In the production of the game were involved ten departments of the company located in Montreal (the main studio), Toronto, Singapore, Quebec, Annecy, Shanghai, Chengdu, Kiev, Montpellier and Bucharest. In the game, the player portrays Arno - one of the members of the Assassins’ brotherhood who does variety of tasks in the eighteenth-century Paris, during the French Revolution. The creators took care of reproduction of the most famous places of the French capital, including the Seine river and Notre Dame cathedral. In 1789, the French Revolution changed in a veritable hell on earth Paris that used to be beautiful. The poor inhabitants of the town were opposed to the aristocracy that in a bloody way tried to suppress all rebellions. The player personates Arno - the hero in the center of this ruthless struggle, who tries to change the fate of his nation. During the adventure, he is driven by personal motives because he suffers a great loss for which he feels responsible and now he is seeking redemption. Assassin's Creed: Unity introduces some changes in comparison to the previous version, which do not only affect the new hero. First of all, there is introduced Adaptive Mission Mechanic system, so the player is no longer guided by the hand during the mission. In previous version, the players received the specific goals, if they fail, the mission had to be repeated from the check point. In this version, for example, if your task is tracking given individual, you just have to find the person again, in case of lose him or her. The game is continued even unsuccessful attempt what increases so-called immersion. What is more, Paris is changing under the influence of your actions. The more dead bodies on the street, the larger number of guards and patrols on the streets and your enemies will become more careful because they will be aware of the threat. The game has also been improved for a more natural movement parkour system. Arno, like his predecessors is able to climb on all buildings as well as better descent of them quicker. There are also less all-pervasive haystacks which now appear less often. What is more, the character had the ability to creep. There has also changed the fight, which now is more demanding and the opponents are more intelligent and stronger, so getting out of trouble is not as easy task as it was before. During the game, Arno changes. The developers have prepared an extensive character development system - the earned experience points can be spent on the development of the character's skills in three aspects - creep, combat and navigation. In addition, his outfit and equipment can be also modified. The game can be played in a single player mode, but the developers took also care about online cooperation for four players. For this purpose, there were prepared special sabotage and executions missions, protecting designated people and so on. In each case counts close cooperation, communication and use of skills. Assassin's Creed: Unity is based on a completely new technology, prepared for the needs of the PlayStation 4, Xbox One and PCs. The new engine is capable of generating even 5000 independent characters watched on the screen at the same time (30 times more than in the previous version). Moreover, the player can see not only the streets, but also the interior of the buildings located in the heart of Paris. Assassin's Creed: Unity PC players' expectations: 9.1 / 10 calculated from 2321 players' votes.